Mangaluru, Oct 30, 2016 : As per reports, the Karnataka High Court on Oct 28, Friday stayed the ban on Kambala(buffalo racing) by the local administration in DK. Kambala events are due to start from November 19 in coastal Karnataka. 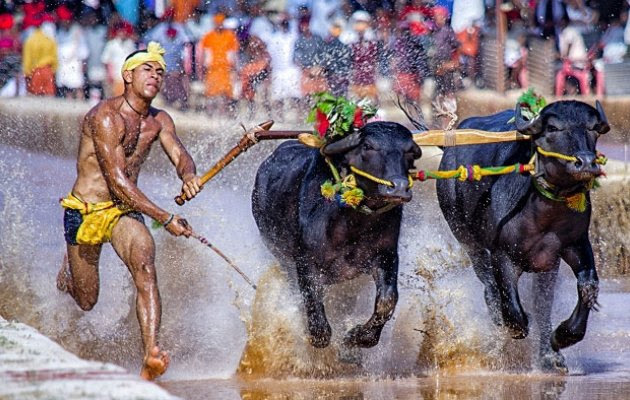 After the local administration denied permission for the Kambala events, a petition was filed in the high court by the DK, Dakshina Kannada and Udupi Districts Kambala Samiti challenging same. Justice A S Bopanna released stay on the order of the district administration. However the rules stated by the government vide its order dated December 17, 2015 viz. not subjecting the animal to any kind of cruelty, provision of proper food, water and shelter etc. must be strictly adhered to. The Kambala has been a traditional fest of the coastal Karnataka region usually held between November-March and the buffaloes made to run in paddy fields filled with slush and water. The contest generally takes place between two pairs of buffaloes, each pair raced in wet rice fields, controlled by a whip-lashing farmer. Rewards are presented to the winners.